One good thing about winter is that it almost requires a cup of hot chocolate from time to time. One of the best hot chocolates I’ve enjoyed is Lavender Hot Chocolate. You’ll find a lot of recipes out there for lavender hot chocolate. I like this one quite a bit. It uses whole chocolate instead of cocoa powder which makes a creamier cup of hot chocolate. Start out with the recommended amount of lavender and then adjust according to your own taste. Don’t use too much or the lavender will overpower the hot chocolate. 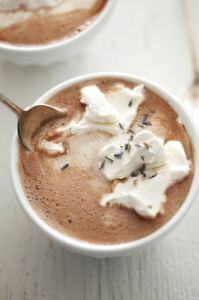 Click on the How to Make Lavender Hot Chocolate link below to see the recipe. Enjoy!